The Best Picture victory for “Milk” is going to be the lede for most people as far as today’s New York Film Critics Circle awards is concerned, but the bigger story is “Happy-Go-Lucky,” which finds itself right back in the thick of the Oscar conversation. The group handed Mike Leigh and Sally Hawkins honors for Best Director and Best Actress respectively for the film. This marks the second award in as many days for both. Leigh won the screenplay award yesterday with the Los Angeles Film Critics Association and Hawkins was also singled out for her performance. But back to “Milk,” I was a little surprised to see the film do so well here, also taking honors for Best Actor (Sean Penn) and Best Supporting Actor (Josh Brolin). It’s a slightly more populist opinion from a crowd that likes to be fringe, though Jenny Lumet’s screenplay win for “Rachel Getting Married” was anything but a shock. Penelope Cruz continued her expected steamroll through the Oscar season with yet another supporting actress win (she won with LAFCA as well), while “WALL-E” surprised no one with a victory as Best Animated Film. Meanwhile, Anthony Dod Mantle, who came in as a runner-up with the L.A. critics for his work behind the camera on “Slumdog Millionaire,” happened to walk away with the honor today. “Man on Wire” took honors for Best Documentary, while “4 Months, 3 Weeks and 2 Days” won for Best Foreign Film. It was yet another day of snubs for “Revolutionary Road,” which turned up with zero nominations from the BFCA and no mentions from the L.A. critics. And a film that has suddenly become a real threat as the first major precursors have begun to arrive, “The Dark Knight,” hit an expected roadblock with the Gotham crew, finding no love in any category. Slightly more surprising, however, is the lack of recognition for Darren Aronofsky’s “The Wrestler.” But I have a hunch it was in the hunt throughout, maybe just coming up short in this category or that. And if it’s not Penn, it’s Rourke. 4 months, 3 weeks and 2 days? god they are really out of their minds. Rev Road is rapidly falling out of contention. Chalk up another win for “Man on Wire”. I get the feeling “Milk” is going to win, based on how this is going. Which, frankly, is a shock. It’s going to be wall*e! Kidding. I have a weird Rachel Getting Married vibe for some reason. Yeah, looking like “Milk” or “Happy-Go-Lucky” at this point. Maybe they’ll just give it to “Forgetting Sarah Marshall” to make things even more interesting… just kidding. It does look like “Milk” vs. “Happy-Go-Lucky”. Best Film is taking as long as Best Director. Looks like they cant seem to make up their minds on this. Yeah it definitely is looking like Happy-Go-Lucky or Milk and it’d be foolish to bet against them at this point, but I have a feeling it could be another Mulholland Dr. situation. Battling groups (In the Bedroom v. Gosford Park v. Shrek) settle on another option. They sure are taking their sweet time. The suspense is killing me! Just because Josh Brolin wins, all the New York critics “hated” The Dark Knight? Calm down. As for the foreign films, I think they vote based on what was released in the calendar year, so the “4 Months” win is legit. And richly deserved too. They will choose one of the top five up on most ballots. Milk should emerge the winner. I still say Milk can beat Slumdog, although Slumdog is in the lead. Thank God TDK recieved nothing. Though I’m disappointed that The Wrestler walked away with nothing either.. I remember a few (dubious) parallels of Batman to Bush, but there weren’t any direct connections to 9/11. Well Heath Ledger was a close second, so they didn’t “hate” it. Oh… am I the only one who feels Scott-Thomas’ steam has settled? Even though it’s still early, her presumptuous critical haul doesn’t seem to be happening nor does it feel like it will happen. Jolie’s buzz has fizzled as well. I think all this bodes well for a Blanchett nomination, and assumingly Leo. Plus, I personally just find it ridiculous that Brolin won over Ledger because IMO he was good throughout Milk, but not great. His only truly great moments were in the drunken scene. If someone’s going to win over Ledger I’d rather it be Shannon. Yeah, if Thomas can’t win over the critics awards, her ship has sailed. I don’t think the Academy will be too willing to pop in a French film either, despite last year’s winner (who, truth be told, was very diligent about working the circuit). yeah, Thomas is dwindling. I thought for sure she would sweep the critics awards. I wouldn’t count Jolie out yet, although she prob will be come Oscar time. I think she has fared much better in the precursors than Thomas. At least she got a BFCA nod. Now the question, with the young Hawkins getting critical support, will the academy be willing to include Hathaway? Despite being a bit underwhelming, I don’t think they will pass up Streep. Leo seems to be getting the critical support for drama. The two Kates will probably get in, if nothing else then for at least being apart of a Best Pic nominee. Hathaway will probably settle for a GG-nom. I like this better then the LA critics. 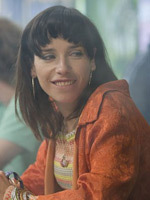 Milk, and Sean Penn are deserving winners as is Sally Hawkins who needed this critic support and is getting it! And eys on “4 months 3 weeks and 2 days” very deserving. Don’t care for the Cruz and Broslin love but still these are some good choices. But I a, surprised that despite the Milk love Gus Van Sant wasn’t higher ranked for them for director. I thought “Happy-Go-Lucky” would rally in the critics’ awards, and glad to be proved right — Mike Leigh is such a smart pick for Best Director. What this means in terms of Oscars is sketchy, but I feel comfortably (finally!) predicting a nod for Hawkins. I really thought this would be one place Mickey Rourke would cruise to victory, though — colour me disappointed, much as I admire Sean Penn. i think people underestimate the power of Mike Leigh and his brilliant ‘comedy’. it’s a perfect comedy spot filler this year.almost every year there have to be one. also,looking at the precursors so far,HGL has GS nom,GG nom and NYFCA mention as a 2nd runner up for BP and award for BD.